Brana Malobabic Giancristofaro is the Chief Operating Officer and the Founder of the MonRoi Company,which makes a device called Monroi. Monroi allows tournament players to keep score electronically. Brana talks with Monroi spokesperson Jerry Hanken about a personal experience which led to the idea, resistance to technological change, and how Monroi protects against cheating and theft. When did this idea for an electronic scoresheet first come to you? I played at the Canadian Open, in the summer of 2002, and I mixed up my score-sheet. Later on I wanted to reconstruct my game and show how I did, but I couldn't because the score-sheet was illegible. I went to an arbiter and asked if I could use my PDA to record moves, and he said, "No, you would be cheating." So, then I said, "Oh, it would be wonderful it there were a possibility to create a secure device that could be used for the recording of chess moves, so I could make a readable notation, and I could transfer it right away to a computer without spending hours typing it. "The arbiter said, "You are kidding, of course. You know, this would be very difficult to do, all the certifications, and all the laws of chess…"
So it was actually a personal experience that brought you to look for this technology then? Yes, it was. Of course, it would have been easier to improve my penmanship. Prior to this, you were in another kind of technical field - you told me something about your background in optics, am I right? I used to work for Nortel Networks, a company that develops optical backbone switches, and voice and data high technology equipment. I have a B.S in electrical engineering. How long did it actually take you from the idea to reality? The first step was to file the patent, which was done in January 2003. From the concept to create a system for the recording of moves which is secure, all the way to live broadcasting, to the final product, it took about two years. We applied one of technologies which I developed for low-power, wireless sensor networks. The uniqueness of this technology is that it saves a lot of battery power, while it reaches up to one kilometer. The Monroi device comes in various colors. You were able to create something that didn't take all that much power, but had a pretty good range that was wireless, like a cell phone or a hand-held, wireless device, and the technology there was what made the breakthrough possible for you to be able to create this marvelous device. BMG: That's right. If you have a PDA with WiFi (the standard wireless protocol) in it, in 3 or 4 hours, your battery is gone. The chess game can last 6 hours, and you need it really to last for two rounds a day at least. So, 10 hours is a requirement of the chess tournament. So, actually, with the MonRoi device, the battery will go through a 2-Round-a-day tournament? Yes. The battery could even last a week (the whole tournament), if you enable the battery saving mode. Wow, that's very impressive, and of course, then it just recharges very simply, I've done this. You just plug it into a wall socket, and you're ready to go for the next day. You have your game in there, and what other things do you need? You need a printer, right? The tournament organizer usually has a printer, and it's nice to print out your score-sheet after the game or you can print it out also at home. You can print out your game from the Internet at the www.monroi.com website, or you use MonRoi software that prints your score-sheet directly from the software package. The printed score-sheet includes even your time information, which is neat for me as a chess player. Yes, I noticed that on my score-sheet. You actually know how much time you're using, and I can see, gee, I only used 1 second on this blunder! Knowing how much time you spend on each move is important. I think that if I'd had this during my chess development as a kid, it would have helped me a lot because I was running into time constraints. How strong did you get? Don't be coy! 1800, not a chess prodigy. Wasn't really at the level of Grandmasters. Well, of course. I never played at that level, except every once in a long while, but you've virtually given up playing because of your tremendous involvement in promoting, and handling the technology of the MonRoi system, right? Right, it's a wonderful thing. It combines my skills in chess, engineering, and business. MonRoi helps promote chess worldwide. Oftentimes, it's hard to take your passion, turn it into an expertise, and then turn it into a business. That's a triple-threat, that's killer. Yeah, once you find a thing that you like to do, it's like you don't work at all. You can work 12 hours a day, but you don't feel like it's work because it's something that you love, right? Well, how do you see the future of these kinds of things? Do you think there will be competition? Right now, it doesn't seem like there's anything quite like it. The auto-sensory boards are used, but they're quite bulky and hard to get around, and they don't have the nice, easy hand-held capacity that the MonRoi device has. Do you see you're going to be facing competition soon you think? How do you deal with the patents for this particular technology? One would probably need to license the technology from MonRoi, if they wanted to produce similar products because of the patent infringement, which represents a significant barrier to enter the market. Well, ok. I'm always pessimistic about these kind of things, because it just seems like some kid in Hong Kong will figure out how to do it, and get around it, but I have confidence in your technological expertise, so if you say that that's going to be the way it is, I'll accept. It takes a lot of time to create a new product, a lot of financial resources, a little bit of luck and a lot of hard work. Even if someone invests money in development, whether they would succeed or not in the end at creating the final product is a question. Statistics show that only 20 % of companies actually succeed in commercializing new products. At multinational corporations like Nortel, we would simply acquire a company if we are interested in the market or the product potential. Now, there have been some technical challenges with people I know who have used these, in getting the 80 or so, or whatever number of games that can be stored on the device itself, onto a computer, because this requires a step in between, right? One needs a small memory (SD) card- the same memory card which goes into cameras or laptops, and fits within the MonRoi device. SD card can store thousands of games.We provided this as part of the package during the Holiday Season. This SD card, people might already have at home. If they don't, they could get it for $10 in any electronics store. So, instead of 80 games which you can store locally on the device itself, now you can save thousands of games on this memory card. Each time you reach capacity in the MonRoi, you can take that and put it directly into a database in your computer, and then you can take your next 80. Yes, absolutely, and the database on your computer can help you with analysis of your games. Yes, of course. Greetings to Frederic! Now, here's the really tricky question about this: how secure are these devices? With the paranoia that abounds in the chess world today, at the World Championship, with Kramnik and Topalov accusing each other of cheating by having devices hidden in bathrooms, and all this craziness, I'm sure you gave a lot of thought to this. A Monroi is small, and could easily fit in somebody's pocket. How do you protect the person who buys these, or even the organizer, from theft and from possible cheating? We put a lot of thought and a lot of though into the security of the system. One of the things that the MonRoi device has is a lock of the personal profile. This means that once the owner's name is entered, it cannot be changed. So if anybody takes it, we can read the original owner's name. So, somebody could not steal one and use it because the name would be displayed as a part of the broadcast. Right, exactly. The device broadcasts the name right away, before the 1st Round starts, even if the tournament organizer doesn't have the name of the person using the MonRoi. Do we call the central device for collecting chess moves a 'hub'? Yes, the hub receives information on who are the MonRoi device owners in the room, and this information is communicated, and so theft is minimized. In fact, we received no complains that a device was stolen. And you've been operating all over the world, for a year and a half now. Yes, we live broadcast over 10,000 games on 3 continents. And not one stolen? That's amazing! You know, when Bill Goichberg used to put out clocks for people to use in the tournaments, he'd come and half of them would be gone, so he stopped doing that. The MonRoi device cannot be taken away from the board during the game (the same as paper score-sheet)…What causes cheating is receiving outside help and the MonRoi device doesn't receive any signal back in the recording mode. …during recording it sends information one-way, from the player to the hub. Even if there isn't a hub, like at the American Open, I was still able to use the MonRoi, enter my games and that was perfect for me. Also, no ordinary person can go in and change the name in the profile, so it's secure. Jerry Hanken, getting comfortable with his Monroi. Yes, we don't use any Windows or Linux, the MonRoi device is based on the proprietary operating system, of which the code is known only to MonRoi. I like how the name of the device actually means, "My King". How do you overcome the natural inertia of chess players to want to do things the way they've always done them? The rules of chess have not changed in over 400 years, and somehow, suddenly, this is something new. The shift from using analog to digital clocks was a culture-shock in itself, and now, with the advent of the MonRoi, some players may feel awkward at the thought of keeping score without writing their moves. How do you handle this? There are users who want to own new products that come out when it save them time and makes their life easier. They will go for the new technology right away, and so they are the 'early adapters', I am one of them. However, there are always traditional types, who may take longer to decide and they like to see other people using the new products before they invest their own money. It's especially popular with the kids. When they see their friends using this device, they ask their parents to buy them one. When they see the benefits, like not making as many mistakes in recording their moves, and in not losing their score-sheets anymore, they see how useful this is. They can even pull up their games from the Internet from anywhere, so that gives them such flexibility, many want to have one. Their games are live on the Internet and their friends and family their games in real-time. Kids call it "Cool". Of course, that's a sword that cuts both ways. There's the Bobby Fischer syndrome, "Hanken, don't look at my secret analysis, get away, get away!" that was literally Bobby's reaction to me, once when he was 18. There are some Grandmasters who make a profession of hiding their score-sheets from anybody, and trying not to get their game scores publicly known. So, MonRoi has to then deal with organizers in this area, right? The organizers like to collect PGN files for bulletins, they love their tournaments to be more visible, to get more publicity, and they love also to promote chess players who are attending those events, and that's the reason that organizers get more attendees for the tournaments. The MonRoi system makes chess tournaments more modern and attractive, thus opening up new opportunities with advertisers. One of the strong points for me, Brana, is that the MonRoi allows me to create a historical record that will be around for centuries to come. …and these games will be electronically preserved and even neatly written out on score-sheets with how much time has elapsed. This, to me, is wonderful information and, giving the opportunity to anyone to access this, to review the games, and advance as fast as possible, to see the novelties that are happening on the Grandmaster boards is fantastic. I noticed a copyright disclaimer for viewing of chess games at the World Databank of Chess. Some people have misunderstood this to mean copyrights of games. Can you share comment on this. This disclaimer is for the purpose of propriety software, chessboard viewer, collection of data and for live games functionality. It does not pertain to individual game copyrights. I know you've been in Europe, and I know you've been in South America, in Asia, how much resistance among the really top players have you faced when the organizers decide they want to use these on the top 10-15 boards? There were two types of tournaments where we placed the MonRoi system: the first ones were closed, invitational ones where the organizers made the MonRoi System standard. Paper score-sheets were not provided at all. For example at the Montreal International, there were no paper score-sheets, so all of the players arriving at the tournament knew that they were going to use electronics. The closed tournament can afford to provide devices to all the players I a tournament. However, the challenge for the open tournaments is that there are so many players; the organizer cannot possibly invest in thousands of devices. So, he has to provide 10, 50, 100 max, and allow the players, if they are interested, to broadcast their games to lease or purchase the MonRoi devices. But usually the practice has pretty much been that if the MonRoi is offered on one of the top boards, and one player is not using it, almost always the other player is. The organizer of open tournaments sometimes offer paper score-sheets as well as electronic score-sheets to players, and about 90% of players pick electronic. That's amazing for new products. I'll bet you got a kick out of it when I reported in one of my stories on one of the Grandmasters who held up a paper score-sheet, and said, "I've already forgotten how to use this!" By the way, you do have very nice photos on the website, and we're very appreciative of those photos – they bring a chess tournament to life. Live games displayed on Monroi.com include many lively photos of the participants. Yes, I think so. I also catch myself curiously going through the games at the MonRoi site, to see who is playing and to put a face next to the name. We take photos at the tournament, sometimes making a theme- like at the Kings Island we had a "hat theme". You would be surprised to see how many chess player wear hats while playing. Well, there are million other things I'd like to ask you, Brana, but we're running out of time, but I think the people who read this, and who see this will have some understanding of what went into the creation of this, and I guess the last question is this: How tough was it to get the United States Chess Federation to accept this as a legal electronic score-sheet? Was that a tough sell? Um…(laughs) It was just part of the job. The device FIDE certified is in compliance with the Laws of Chess, however, certain rules differed with the USCF, as we learned last year… We made slight modifications with the help of the USCF. Your company is amazing, I see a great future, and I hate to sound like a cheerleader. It is really my own enthusiasm for both the historical and the practical side of its use that sold me on it. Now, it took a little while before I believed in it, I was one of those people who had to be convinced. Zeljka from MonRoi, who runs the system at the tournaments showed a lot of patience til I began to understand how to use it. So, I think that we have made a real effort here to educate you people out there as to how it works, what it's for, but I think that the overwhelming sense that should come from this, is that this is for chess, and for lovers of chess. Absolutely, it was created for chess- chess players and organizers, to make chess more popular through the new technology that wasn't available before, and we are very happy to be a part of it. I want to thank you Jerry, for your wonderful support. In addition I would like to thank to Bill Goichberg and to Bill Hall, they are amazing leaders, and they are doing exceptionally great things for chess in the United States. 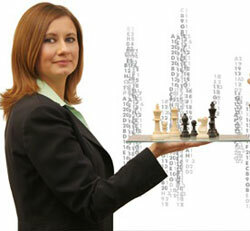 You're an engineer, you're a businesswoman, but you love chess, don't you? (nods and smiles) I love chess, chess players and the whole chess environment- it's very dynamic. And you really enjoy watching a good game, to see a good game, and certainly to play a good game. Oh, I've seen here at the North American Open in Las Vegas, a couple of good games. I've so much enjoyed watching GM Nakamura and GM Shabalov, and many of the games are fantastic. And you saw a great queen-sacrifice from my own game. Yes, of course! This was amazing. Our chess friends would say- "You rock." My response would have to be, "Aw, shucks." And, on that note, let us close this interview and thank you so much Brana! Jerry Hanken is the president of CJA, Chess Journalists of America. He is a longtime and prolific contributor to Chess Life Magazine.